I used to love shopping for Christmas gifts. I think part of it was the thrill of the hunt. I loved trying to find the “perfect” gift for each of my friends and family members. The other part was I enjoyed seeing the look on people’s faces when they opened my gift. As years went by though, I got less and less high on the adrenaline and challenge of hunting down holiday gifts. I also realized with some sadness and irony that most of the time my so-called “perfect” gift wasn’t something that the person was going to use regularly or in some cases, ever use at all. Now, I spend a lot less time and money on buying gifts. The gifts that I give out now are ones that can be consumed and/or experienced. I don’t want to give out another thing that someone has to take care of, maintain, dust or eventually donate to the Goodwill! Here are some gifts that Marcus and I are giving out this year. Super easy and inexpensive! 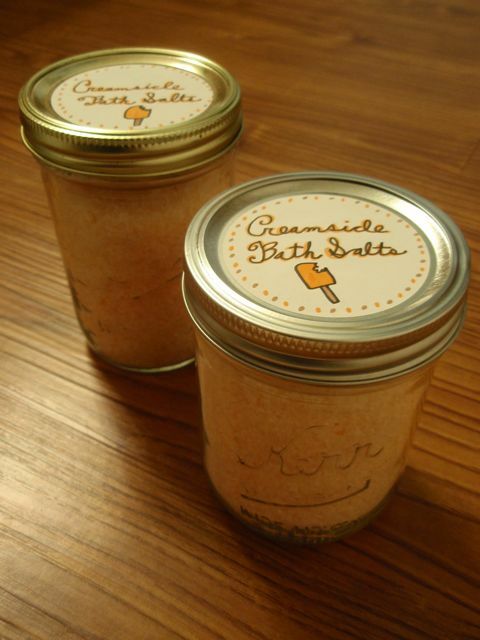 I make these bath salts for birthdays, hostess gifts, thank you gifts and holiday gifts. I think people appreciate receiving them because it encourages them to take time out to soak and relax. I adapted this recipe from Homemade Simple. Dump both salts into the bag. Seal the bag and shake until well mixed. Add 1 drop of food coloring. Seal and shake to distribute evenly. WARNING: Food coloring is potent so use 1 drop at a time until you reach the color you want. 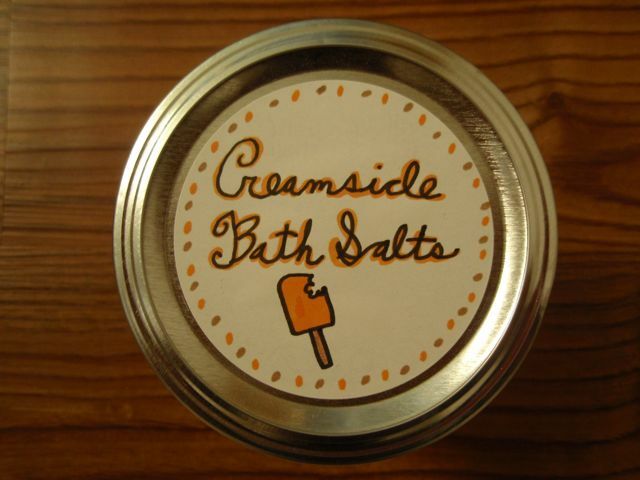 For my Creamsicle Bath Salts, I used about 2 drops of red and 3-4 drops of yellow. Add 2-3 drops of essential oil. Seal and shake. Repeat until you reach your desired amount of scent. I used what I had in the house: vanilla extract and sweet orange essential oil. When I mixed it, I realized that it smelled just like Creamsicles! Spread salt out evenly on a wax paper-lined baking sheet. Let dry for 1-2 hours. Pour salts through a funnel into a clean, dry jar. I prefer using Ball canning jars but you can use any jar with a tight-fitting lid. Label the lid of the jar with the name of your salts. Get creative and have fun! To use, sprinkle half the contents of one batch into hot, running water in your bathtub. Swirl the salt with your hands to help them dissolve. Soak and relax! The holidays are a great time of year to give people tasty treats that they might not ordinarily buy for themselves. There are many chocolatiers to choose from, but I like to give Theo Chocolate bars because they’re yummy, organic and fair trade, made in Seattle, and they come in all sorts of interesting flavors. My favorites are the Raspberry Dark Chocolate, Salted Almond Dark Chocolate; Hazelnut Crunch Milk or Dark Chocolate; and the Chai Milk Chocolate. My nephew Logan’s favorite is the Gingerbread Spice Milk Chocolate. I usually buy them from Bartell Drugs (my favorite store!) or Fred Meyer when they go on sale. On sale, can get them for as low as $1.79 to $2.50 per bar. Another tasty, edible treat that people may not ordinarily buy for themselves because it seems too decadent is fancy-flavored popcorn. Marcus and I love Uncle Woody’s Popcorn which is made in Seattle and uses 100% pure ingredients–no artificial coloring or flavoring. Again, we buy the packs when they go on sale for around $3 at Bartell Drugs in December. You have to try the Cinnamon Butterscotch Caramel Corn! Every summer, we harvest the tiny, golden plums from our one fruit tree and make them into jam to give as gifts. We use the traditional water-bath canning jam recipe that comes in the SURE-JELL Pectin package. If you don’t have a fruit tree, consider buying fruit when it’s in season and is at a good price. If you can’t make the jam right away, wash, chop and freeze the fruit for later use. People love getting homemade jam! I hope these gifts give you some great ideas for your own gift list. Hope you have a very happy and Super Frug holiday season! This entry was posted in Fun & Entertainment, Health & Beauty by Peg. Bookmark the permalink. You’re very welcome, Katy! Hope you enjoy the recipe. Let me know how it goes.